The Supportworks Geo Con Division also provides Anchored Earth Retention services throughout the Northwestern Arkansas, Eastern Oklahoma and Southern Missouri areas. Soil Nailing with shotcrete facing is an effective method for retaining soils in either temporary or permanent applications. Soil nailing consists of the passive (non pre-tensioned) reinforcement of existing soil by installing closely spaced steel bars (called “nails”) within an angled pre-drilled bore hole. The nail is then encased in grout. The soil nails are then forced into tension as the ground deforms laterally in response to the loss of support caused by continued excavation. 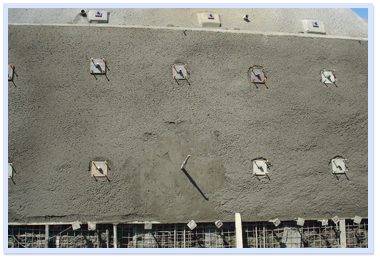 The construction process in earth retention is from top to bottom and shotcrete is applied to the face of the surface to provide continuity and as a final facing for permanent walls.